Ancient Haridwar, "the Gateway to God", is one of the oldest living cities and one of the seven holiest places in India. (The others are Varanasi/Kashi, Kanchipuram, Ayodhya, Ujjain, Mathura, and Dwarka). Hindu gods are believed to have incarnated at these places various avatars. For Hindus, a pilgrimage to Haridwar will provide liberation from the endless cycle of death and rebirth. The area around the Ganges River is made up of a fascinating and colorful collection of sadhus (holy men), pundits (Hindu priests), pilgrims, guides, and beggars. Every evening, the river comes alive with the magic of the aarti (worship with fire), as lamps are lit, prayers are offered, and small candles are floated down the river. A visit to this holy city will give you great insight into some of what makes India tick. Haridwari sits alongside the Ganges River near Rishikesh, at the base of the Shivalik mountain range in Uttarakhand. Trains from major cities all over India stop at Haridwar on their way to Dehradun. For those coming from Delhi to Haridwar, it takes a minimum of four hours to get there by train or six hours by road. The nearest airport is Dehradun's Jolly Grant Airport, about 40 kilometers (25 miles) north of Haridwar. Travel time from the airport to Haridwar is about an hour. Expect to pay 1,600 rupees upwards in a taxi. Shubh Yatra Travels offers a reliable service. The best time to visit Haridwar is from October to March. Summers, from April to July, get very hot in Haridwar. Temperatures hover around 40 degrees Celsius (104 degrees Fahrenheit). The clean water of the Ganges is really refreshing though, and May to June is regarded as peak season. The monsoon season, from July to September, is unsuitable to taking a dip in the Ganges as the river bank becomes unstable and currents are strong because of the rain. Winters, from November until February, get cold during the night. As a result, the water is chilly, but there's also mist in the air which makes Haridwar particularly scenic at that time of year. Haridwar's main attractions are its temples (particularly Mansa Devi temple, where the wish fulfilling goddess resides), ghats (steps leading down to the river), and Ganges River. Take a holy dip and cleanse your sins. The main ghat is known as Har ki Pauri, meaning "footsteps of Lord Vishnu". It's said that Lord Vishnu came and left his footprint on a stone wall there. As the sun sets, head to Har ki Pauri ghat to witness the captivating Ganga Aarti (prayer ceremony) at around 6-7 p.m. every night. Fiery lamps combined with the chanting of mantras, clanking of bells and enthusiastic crowd, is very moving. Daksha Mahadev Temple, the oldest temple in the area, also has some intriguing evening rituals. According to legend, Lord Shiva's first wife Sati jumped into the holy fire and died there, in response to her father spurning him. Haridwar is a great place to come if you've got an interest in Ayurvedic medicine, as many roots and shrubs that are grown in the Himalayas are readily available there. The most famous festival to take place at Haridwar is the Kumbh Mela, held there once every 12 years. 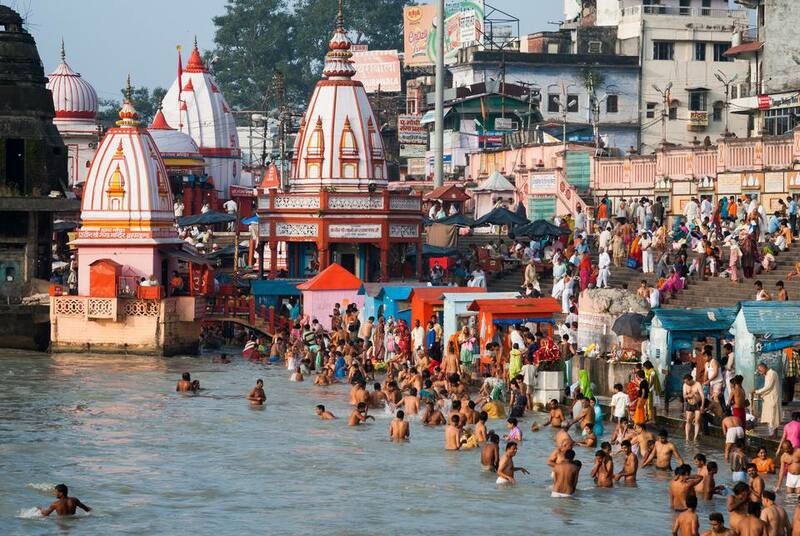 It draws tens of millions of pilgrims who come to bathe in the Ganges and be absolved of their sins. The next Kumbh Mela will be held in Haridwar in 2022. In addition, many other religious Hindu festivals are celebrated in Haridwar. Some of the most popular ones are the Kanwar Mela (July or August) devoted to Lord Shiva, Somwati Amavasya (July), Ganga Dussehra (June), Kartik Poornima (November), and Baisakhi (April). The food in Haridwar is mostly vegetarian, and alcohol is banned in the city as its a holy place. Haridwar is much bigger and more spread out than nearby Rishikesh, so auto rickshaws are the best option for getting around. Bara Bazaar, between Har ki Pauri and Upper Road, is an interesting place to shop. You'll find all sorts of brassware, religious items, and Ayurvedic medicine there. Haridwar hotels are all about location, location! There are plenty of options but you'll want to stay somewhere along the river to really enjoy and appreciate Haridwar. These top Haridwar hotels for all budgets are all well positioned and decent. Chotiwala, at Subhash Ghat, is renowned for its thalis. Bhagwati's Chhole Bhature, on the way to Mansa Devi Temple, is a popular breakfast joint for those who want to fill up on this iconic dish. Mohan Ji Puri Wale, near the police chowki at Har Ki Pauri, is the best place to go for aloo (potato) puri. The sweet ghee items at Mathura Walo ki Pracheen Dukan, near Thanda Kuan Moti Bazaar, always draw a crowd. Hoshiyar Puri, on Upper Road, serves yummy north Indian vegetarian cuisine at reasonable prices (the daal makhani and paneer masala are signature dishes). For somewhere more fancy, head to Ksheer Sagar at Pilibhit House, Ramghat. Rajaji National Park offers unspoiled natural beauty only 10 kilometers (six miles) from Haridwar. Its eco-system is estimated to be 10 million years old, and a diverse range of wildlife can be seen there, including elephants. Those keen to learn more about yoga and Ayurveda can visit Baba Ramdev's Patanjali Yogpreeth, at Bahadrabad near Haridwar. This interesting educational institution aims to link ancient wisdom with modern science. Many people visit Rishikesh as a side trip as well. Although it's situated less than an hour from Haridwar, the vibe is very different there. Haridwar is popular with Hindu pilgrims, who come to cleanse their sins. Rishikesh attracts foreigners who come to study yoga and spend time at its many ashrams. Should You Visit Haridwar or Rishikesh?